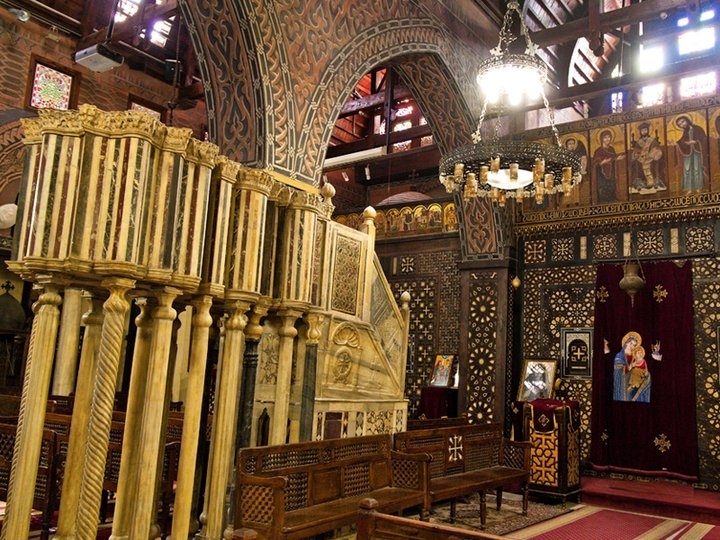 One of the oldest-inhabited parts of the city is Masr el Qadima (Old Cairo), the Coptic neighborhood that provides a fascinating link between Egypt’s pharaonic and Islamic civilizations. In the 6th century BC a garrison known as Babylon-in-Egypt guarded a river crossing here. 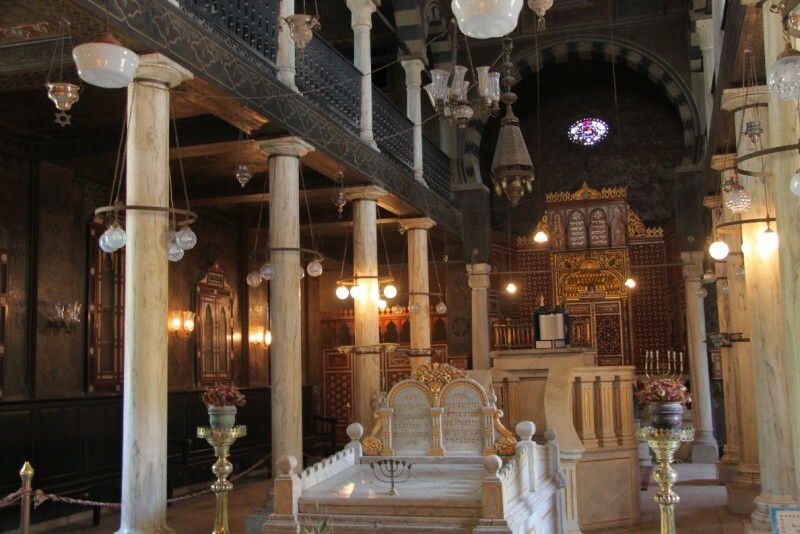 There are some Roman fortifications, but the area’s real attraction is its narrow lanes lined with early churches, and Egypt’s oldest synagogue. 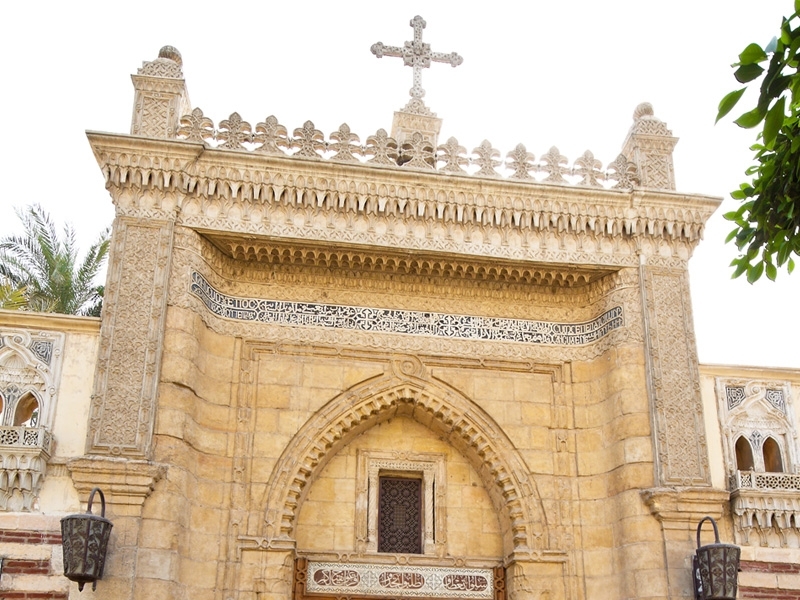 Cairo’s first mosque, built by Amr Ibn al As in AD 642, is nearby. The first thing you’ll see when you get here are two Roman towers, which were part of the fortifications built by Emperor Trajan in AD 130, and some fragments of the walls of Babylon-in-Egypt. Behind these lies the fascinating, recently renovated Coptic Museum, which gives an overview of Coptic art from the Graeco-Roman period to the early Islamic era (from about AD 300 to 1000). It is clear that some Christian symbols may have evolved from pharaonic ones, including the cross and the image of the Virgin and Child. The Copts were excellent weavers and the upper floor of the museum contains a beautiful collection of early textile fragments. A passage near the cafeteria leads to the al Muallaqa Church (Hanging Church) built over one of the Roman bastions, visible at the back of the church. 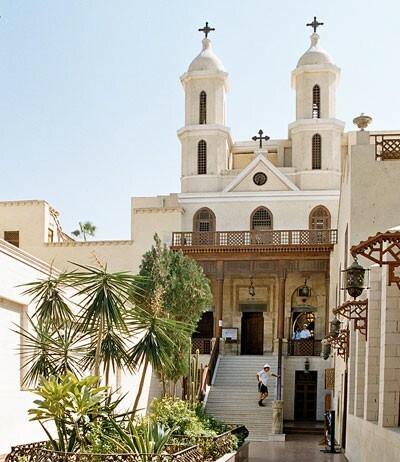 The building is reached via a steep staircase and a vestibule where Coptic souvenirs are on sale. 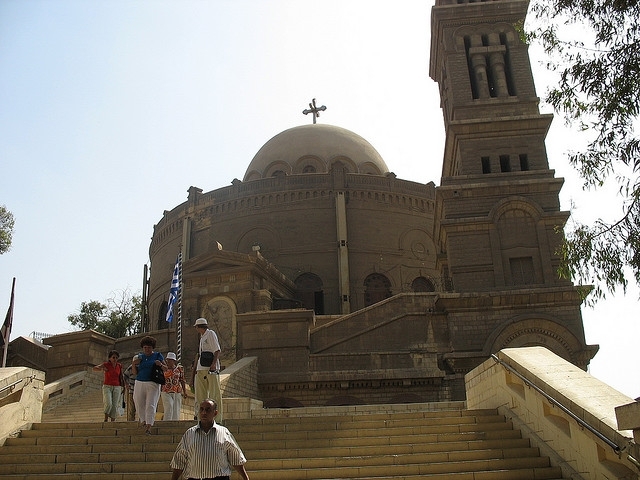 The church probably dates from the 7th century, although some Copts claim it’s older. 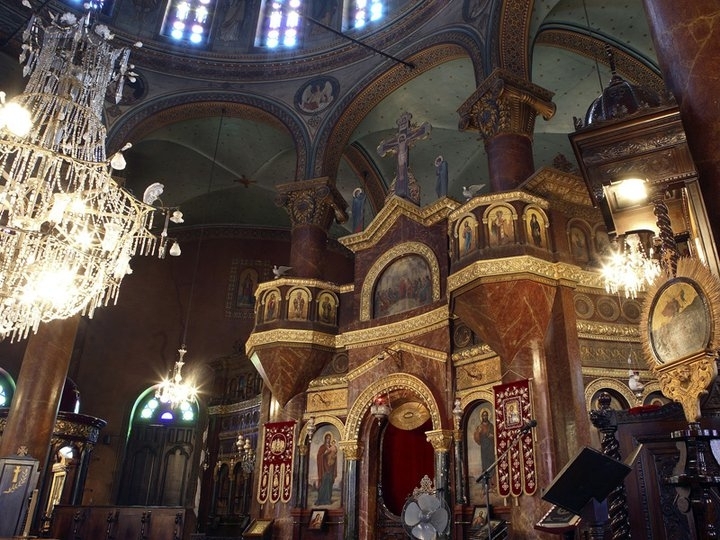 Its dark interior is magnificent, with cedar paneling, a wooden Ark-like ceiling, a fine carved marble pulpit supported by 12 pillars representing the Apostles, and superb 13th century panels inlaid with bone and ivory hiding the three haikals (altars). Probably the oldest church here is the 5th-century Abu Sarga (St. Sergius), with an even older crypt where the Holy Family is said to have rested during their exile in Egypt. In the Chapel of the Convent of St.George visitors wishing to be blessed can be wrapped in chains by the nuns. The Jewish community has long gone but the Ben Ezra Synagogue, at the other end of the street, has been restored to its former glory. 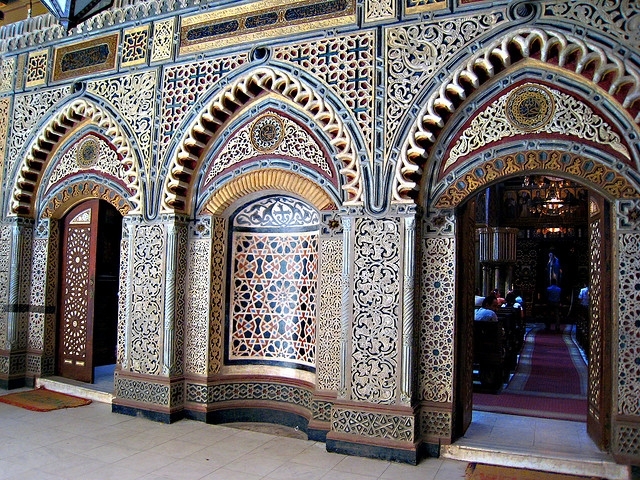 Originally a Coptic church, the building was transformed in the 11th century and the decoration remained very similar to that of the nearby churches. According to Jewish tradition, this is where the prophet Jeremiah preached in the 6th century BC, while the Copts believe that it marks the site where baby Moses was found in a basket. 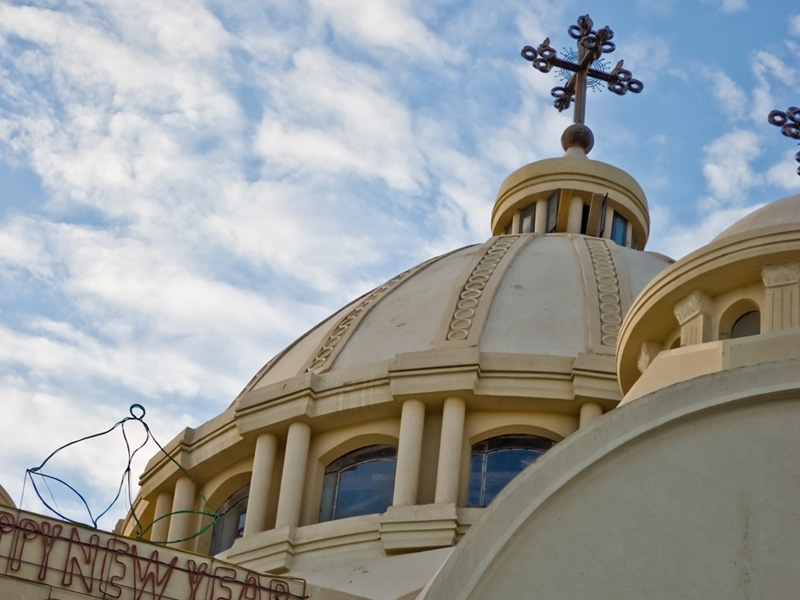 Attend a Coptic Mass at the Hanging Church (Friday 8-11 am and Sunday 9-11 am) and hear the sound of the pharaohs, as the Copts claim to be their direct descendants. The instrument, music and language you hear are similar to those in ancient Egypt. On 1 June, a festival commemorates the Holy Family’s stay in the area. To the right of the entrance of the Hanging Church is a beautiful 10th century icon of the Virgin and Child with obvious Egyptian facial features. Walk along the alleys behind the 11th century St.Barbara’s church to discover a hidden Christian cemetery.